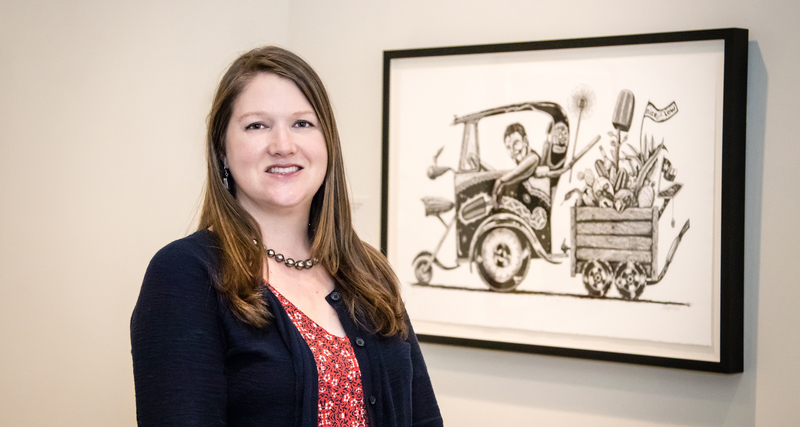 In our ongoing Q&A series, we profile members of the McNay staff to show a behind-the-scenes look at all the people who make the McNay what it is! Today's post features Rosemary Hickman, our Semmes Foundation Education Manager. What is your role at the McNay? As Semmes Foundation Education Manager, I plan programs for teachers and adults. In the simplest explanation, I learn about an exhibition or work of art that we are going to show and I come up with a fun and hopefully unexpected way for people to learn about it. One of my favorite series is Food for Thought, which pairs food and art, and takes place monthly during ArtFULL Wednesdays. For instance, last, we tasted delicious handmade paletas (Mexican popsicles) on the lawn and then toured the exhibition Juan Mora: Culture Clash exhibition to see Mora’s linocut prints of paleta carts. The program highlights a local business, gives visitors a chance to connect over food at communal tables, and to get to know the collections and exhibitions a work or two at a time. A lot of my time is spent not only coming up with project and program ideas, but also hiring local artists to teach specific workshops. I love thinking about something that we can make to form a closer relationship with a work of art. Sometimes we replicate a creative process used by the artist. Sometimes we explore a topic that’s important to the artist. Because I’m working with teachers, the projects also need to flexible, relevant, and something that they can replicate in the classroom. My favorite part of working at the McNay though is simply looking at a work of art with visitors. No matter their age or background, the group will always alter the way I see that object from then on. I get excited anticipating the keen observation of a student, or unexpected expertise of a teacher. There are always surprises, disagreements, and discoveries that we make along the way together. What do you like to do outside of work? What are your favorite things to do and places to go in San Antonio? I love visiting the museums in San Antonio. My daughter and I are fixtures at SAMA’s family days and we take advantage of the late hours and free evenings at the DoSeum and the Witte. The Briscoe is also full of surprises and a great place to visit with kids. You can also find us dancing at outdoor concerts around town and at First Fridays in Southtown. What has been your favorite exhibition at the McNay so far? I mentioned the exhibition Juan Mora: Culture Clash, which was up last summer. Juan taught a few workshops for us last summer, one for adults and one during our Summer Teacher Institute. When I found out about his exhibition last year, I went on our collection database to see his work and really loved it. He works mainly in linoleum, carving huge blocks to make prints about Mexican, border, and Tejano culture. He always has a character, a hero, to root for, surrounded by their extremely detailed belongings and environments. You can find a new hidden object every time you see the print. It’s impossible to see everything at once. I also like the way that he uses language–a mixture of English, Spanish, Spanglish, or Tex-Mex–as a graphic element and to tell the story. I love languages and it’s fun to unlock more of the story by translating the text bit by bit. Through conversations in the show, visitors have taught me about Aztec jaguar warriors, choppers, Mexican potato chips, and most importantly soccer (Juan is a big fan). That can only happen in front of a work of art. What is one thing about the McNay you wish everyone knew? The McNay is a place where you can make friends. Some people, myself included, may feel uncomfortable going new places, but I have seen visitors who started coming alone or with their families to programs quickly make friends and then reconnect frequently at the Museum. They bond over food, a good story, a work of art, kids, or an art project and those experiences give them a chance to reveal a small part of themselves to a stranger. The result of that little risk is often friendship.